Who would have thought that a technique from a rumpled television detective could be so effective for a high powered public speaker? Someone recently reminded us of how Peter Falk, as Detective Columbo, used to employ an sneaky conversational technique that tricked those nefarious evil-doers into thinking they had smooth gotten off the hook when, of course, they actually hadn’t. Those old enough to recall can remember Falk in the original television series, Columbo, in the 1970’s and 1980’s, then several made for television movies after that. 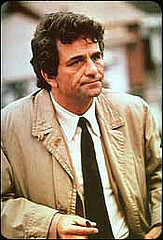 Detective Columbo would typically engage in what seemed to be a random, less-than-effective questioning of a culprit. Just as he was concluding his fruitless interrogation, and was even turning away as if to leave, he would turn back around and say, “There’s just one more thing…” Of course, the one more thing was usually the question that immediately pinned the culprit as guilty through unrelenting logic. It can be tricky to use this technique as a public speaker but, once you hone the skill, you can drop it into your presentation once to great effect. We suggest you don’t try it at the end of the talk until you have some practice, otherwise the audience will think you’re done and start shuffling papers, talking to their neighbors, and preparing to leave. The trick is to seem like you’ve concluded, then nail their ears back with a single whammo blammo amazing point. Are you toying with the audience’s emotions and expectations? Of course! This is an incredibly effective dramatic technique that is incorporated into practically every television episode and movie ever released. If it’s good enough for Hollywood, it’s good enough for you. Try it once. You might like it. On the other hand, you might hate it. It’s okay if you decide that the Columbo Technique is not for you. As long as you have plenty of other goodies in your bag of public speaker tricks, there’s no need to stick with one you don’t like. However, if you’re looking for that slight edge that differentiates you from all the other speakerss out there, why not give it a shot? Oh, and one more thing…we’re not sure but rumor has it that the technique goes over better if you wear an old trench coat and chew an unlit cigar.